Engage in the age old tradition of infant and baby massage with the easily absorbed and unscented Infant Massage Oil. Formulated with kid friendly organic and 100% GMO free plant based ingredients. Free from nasty chemicals such as synthetic colours, fragrances, SLS, PEG, Phenoxyethanol, Parabens and mineral oil. Caprylic/capric triglyceride, olea europaea (olive) oil*, simmondsia chinensis (jojoba) oil*, tocopherol, helianthus annuus (sunflower) seed oil. Warm a small amount of oil in your palms then massage baby with your fingertips. Use long, gentle upward strokes. Massage each little finger and tiny toe to improve fine motor awareness and remember to massage between their folds of skin. Some babies enjoy having their faces massaged too, but only try this if your nails are clipped really short. Storage InstructionsStore at cool dry place. 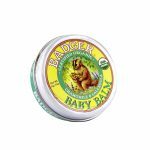 Produced to protect baby’s bottom between each nappy change, this protective barrier cream of Shea Butter and Jojoba, Sunflower and Sesame oils is combined with calming Bisabolol and anti-oxidant rich Vitamin E to soothe and protect.